George H.W. 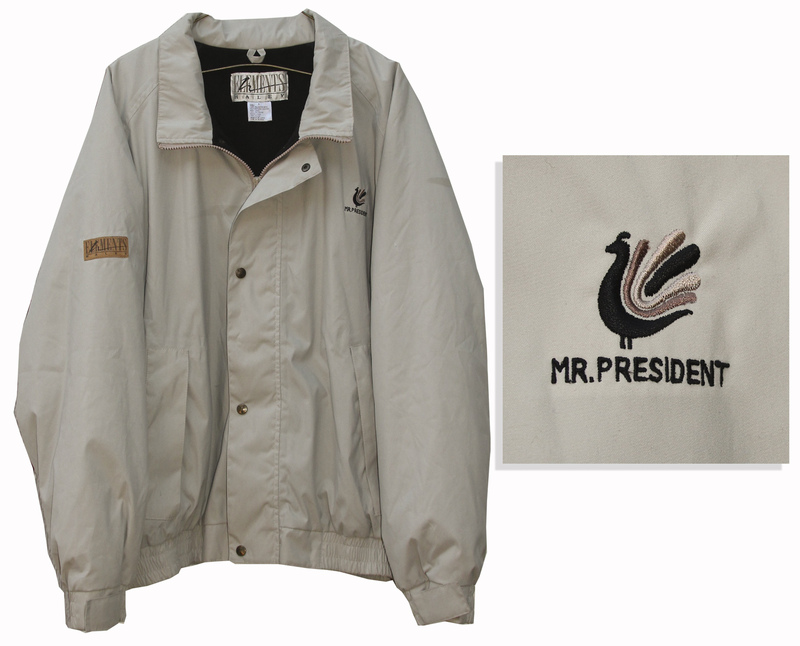 Bush personally owned jacket worn at Camp David. Tan windbreaker jacket by golf apparel brand Haley Elements features a brown and black embroidered peacock logo above ”Mr. President” on the left breast. Size large. Near fine. Provenance from Sharon Bush, his daughter-in-law, with a copy of her LOA. The most expensive piece of George Bush memorabilia that we have sold. Sold for $9,375. George H.W. Bush check signed, made out to the Quebec-Labrador Mission Foundation for $100, notated as a Contribution. Postmarked 13 December 1972, Bush signs in full, ”George HW Bush”. Light bank cancellation and bend to lower right, otherwise near fine. A George Bush autograph on a check is scarce. Sold for $3,438. 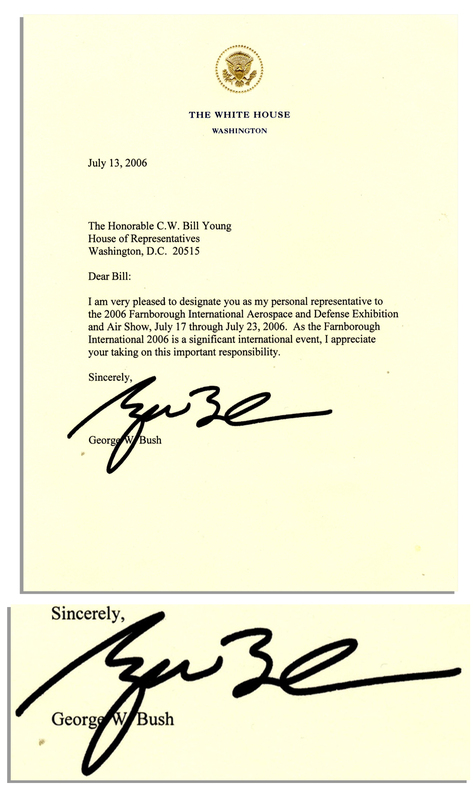 President George W. Bush typed letter signed to Congressman Bill Young, written upon White House stationery on 13 July 2006. Bush designates Young as his personal representative to the Farnborough International Aerospace and Defense Exhibition and Air Show. Letter reads in part: “…the Farnborough International 2006 is a significant international event, I appreciate your taking on this important responsibility…[signed] George Bush”. Single page letter is signed in black felt tip and measures 6.75″ x 8.75″. Near fine. Dark George Bush autograph. Sold for $2,659. President George W. Bush autograph note signed, undated but upon White House stationery. 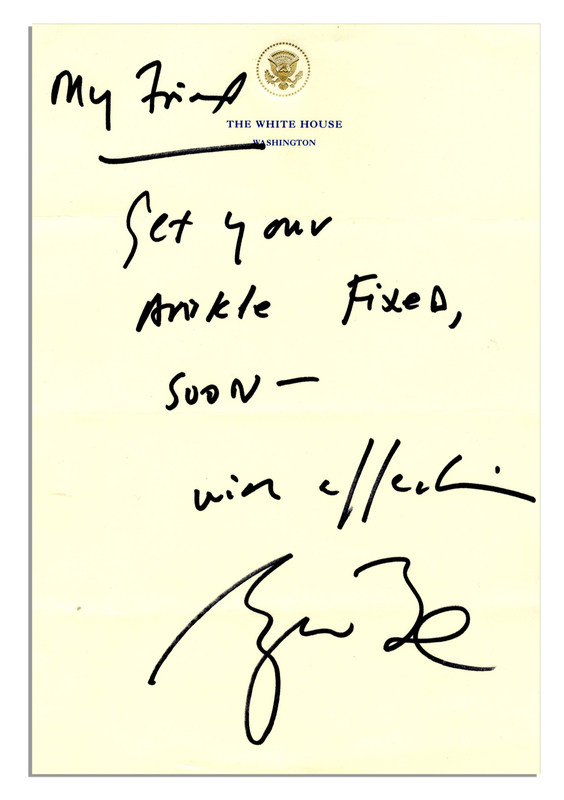 Belonging to Congressman Bill Young, handwritten note reads in full: ”My Friend / Get your ankle fixed, soon – with affection / George Bush”. Written in black felt tip pen, single page measures 7” x 10.5”. Near fine. Bold George Bush autograph. Sold for $2,500. George W. Bush autograph letter signed as President, dated 29 August 2005, shortly after Bush’s re-election. Written upon gilt-embossed Presidential stationery, Bush writes to baseball manager Bobby Bragan in full, ”Dear Bobby, Congratulations on managing again. You were a heck of a manager before, and I bet you still are a live one. Most importantly, you are a heck of a good person – All my best / George Bush”. Bragan came out of retirement in 2005 at age 87 to manage the Fort Worth Cats baseball team. Composed on both sides of 7.25” x 5” card in black felt-tip. Near fine. Bold George Bush autograph. Sold for $2,500. 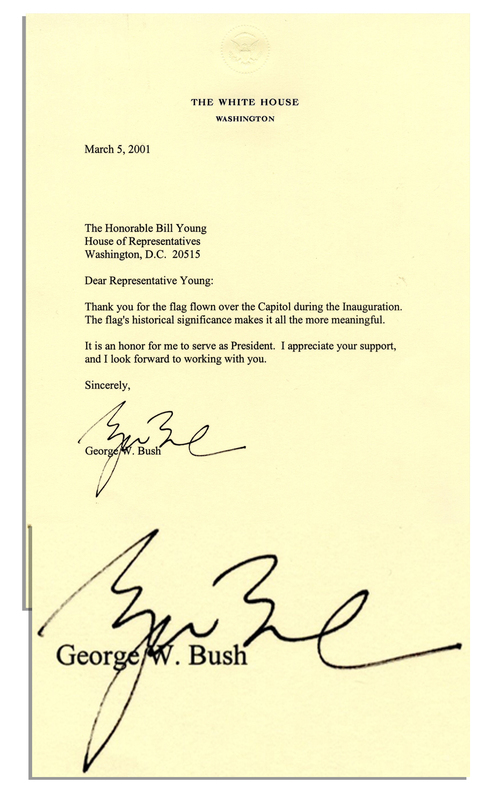 President George W. Bush typed letter signed to Congressman Bill Young shortly after taking office. Letter on White House stationery dated 5 March 2001 reads, ”…Thank you for the flag flown over the Capitol during the Inauguration. The flag’s historical significance makes it all the more meaningful. It is an honor for me to serve as President. I appreciate your support, and I look forward to working with you…[signed] George Bush”. 1pp. measures 6.75” x 8.75”. Near fine. Strong George Bush autograph. Sold for $1,562. Vice President George H.W. Bush typed letter signed concerning ”the problems of international terrorism”. Written aboard Air Force Two to Congressman Bill Young, Bush writes on 14 August 1985: ”…the President has asked that I head a task force to review how our government can better combat terrorism and how we can better work with other governments in the fight against terrorism. The President has clearly stated this Administration’s view that terrorism has no place in a civilized world. The goal of this task force, therefore, is to be certain that we are using every legal means at our disposal to combat this modern scourge…[signed] George”. 1pp. on Vice President letterhead measures 8” x 10.5”. Near fine. 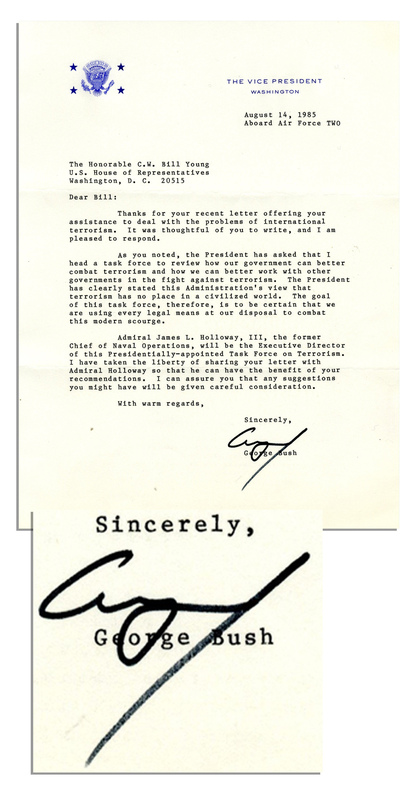 Great content George Bush autograph on a letter. Sold for $866. Wristwatch once owned by George H.W. 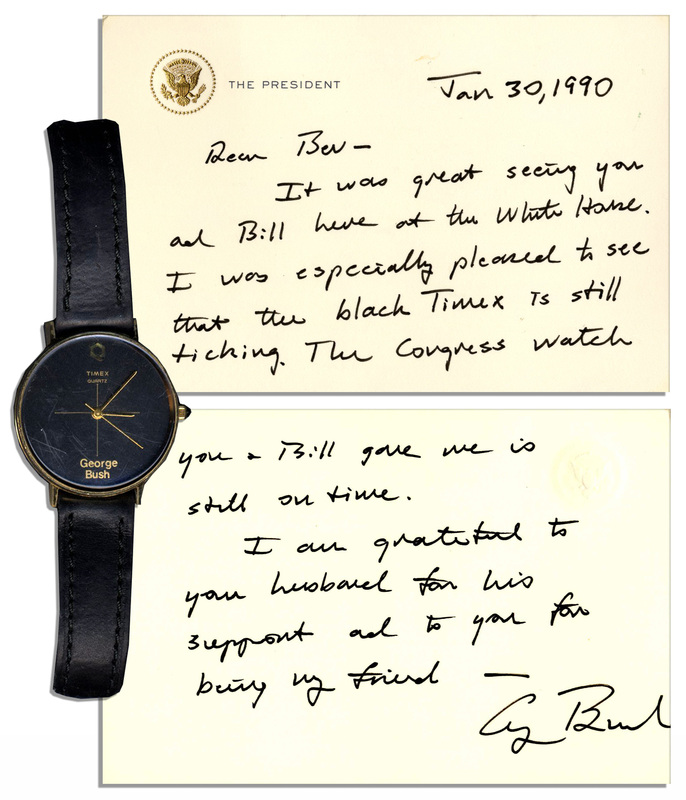 Bush, with an autograph letter signed as President mentioning the watch. Timex watch has been customized with ”George Bush” in gilt at 6 o’clock and is attached to a black leather band. Letter is addressed to Beverly Young, wife of Congressman Bill Young, and dated 30 January 1990. Upon presidential stationery, Bush writes, ”Dear Bev / It was great seeing you and Bill here at the White House. I was especially pleased to see that the black Timex is still ticking. The Congress watch you + Bill gave me is still on time. I am grateful to your husband for his support and to you for being my friend – George Bush”. 2pp. letter on a single card measures 6.5” x 4.25”. Watch has been mounted to a blue velour-covered board. Scratching to watch crystal and not in working condition, else near fine. One of the best pieces of George Bush memorabilia that we have offered.